cook | sheet pan shrimp scampi. Quick but delicious weeknight dinners are my jam. I don’t like to spend more than 40 minutes but I don’t want to be completely boring or entirely routine. I like a bit of variety and I like to have a bunch of strong meals in my rotation. I recently tried a new sheet pan recipe for shrimp scampi and it was so bomb. Instead of serving it with pasta or some other starch, this recipe called for a pile of veggies like zucchini and summer squash and bulked it up with some delicious parm toasts to serve on the side. Everything is marinated in the same garlic, butter, hot pepper flake, lemon mixture and its only one pan. Grab the recipe here. 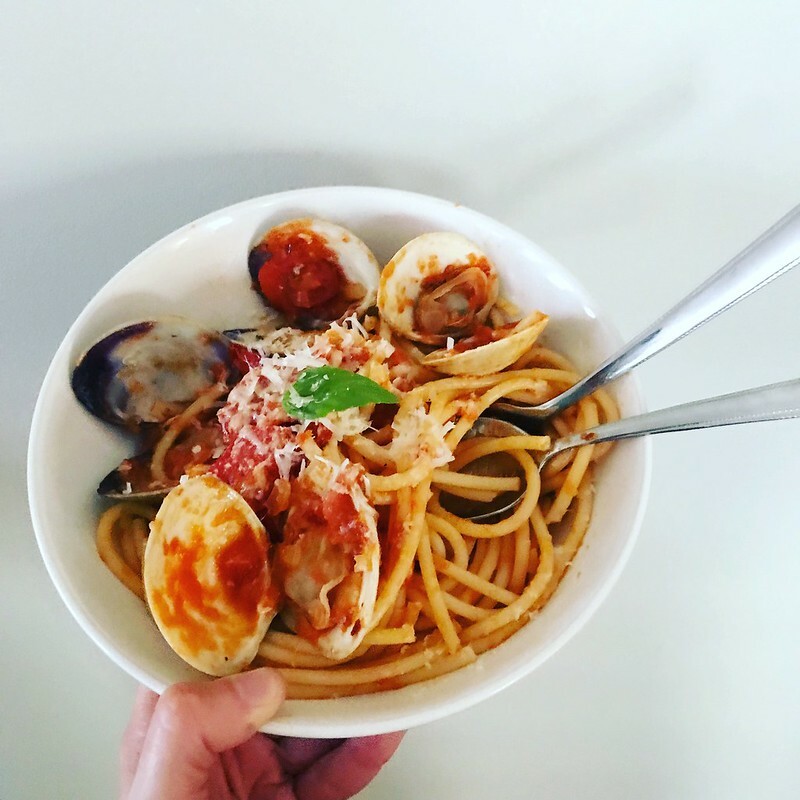 cook | spicy linguine with clams. I love making linguine with clams–and I like to change it up; sometimes a red sauce, sometimes a white wine one. This one was made with some leftover tomato sauce I had in the freezer and needed to use up. I added white wine, garlic, spicy red pepper flakes, parm, and a little basil before simmering the clams in it all. It’s a super quick way to use up leftover sauce and easily transform it. It will be exciting that get back into cooking mode once the weather turns. That’s the only great thing about losing those summer days—new dishes. cooking | simple avocado toast. A simple breakfast. Avocado, fresh squeezed lime, chili flake, salt, pepper, mashed on top of a piece of toast and topped with a poached egg. How do you take your avocado toast? cook | niçoise porch life. Salad niçoise is one of my go-to’s for back porch summer dinners, especially with guests. I like that guests can mix and match–add anything to their salad they like, and leave off stuff they don’t care for. It’s a win win. And now that we’ve finally got back porch weather, bring on those entree salads. What are some of your go-tos? The past two weeks in the Boston area have been a blend of intense, deeply debilitating snowstorms, and–polar vortexes. Most days, the temperature hovered at 0 degrees, with a real feel well below. So for that, we were stuck inside. A lot. And so, I baked bread and tackled charts. These Waves mittens by Tin can knits have been in my queue for awhile--featured in Making Vol. 3, Dots. I’m knitting the smallest size because I have tiny hands, hand knit mittens never fit me correctly, and a lot of knitters claimed these mittens were extra long. The smallest size seems to be knitting up the right size for me, which I’m pleased about. I’ve finished the mitten gusset on one but put them down to work on a hat project when I can’t concentrate on complex charts. Otherwise, these are shaping up to be a quick knit and a total stash buster–I’m using Knit Picks palette I had on hand in a blue and off white. The recipe is Maida Heatter’s Mile High Cinnamon Bread from Food52. What are you knitting–or baking– in the new year? cook | orange scented cod. I love trying new fish dishes–particularly ones that stand up to cold weather. This orange scented cod with jasmine rice is just the dish. It really sticks to the ribs in a healthy way, and the doc and I really enjoyed it. Plus, it takes no time at all, so it’s the perfect weeknight dinner. The cod can handle the asian flavors of ginger and soy; what’s more, I always have these ingredients, generally speaking, on hand. and takes only about 6 minutes to braise. Brilliant. I think it would be really delicious with halibut, too, which is also a recommended fish for this dish. See the recipe here. It’s definitely been added to my weeknight dinner recipes. These are my favorite quick cookie to bake. There’s nothing better than winter days by the fire, a stack of ginger snaps, and bottomless cups of coffee. What other cookies should I make? dinner | prosciutto wrapped sole. Some days, my only opportunity to make and produce something creative is in my kitchen. And that’s o.k. because cooking can be as creative or as rigid as you’d like it to be. Often times, I might look in my fridge to see what I might make that I hadn’t planned and come up with something new. Or, I might build off of a simple recipe idea: lemon goes great with white fish but needs fat, as in this case. Enter this delicious dish I created: prosciutto wrapped lemon sole, baked, and served with lemony spinach and almond Israeli couscous. It was a hit, and so easy to make. Brunching in my house just got a major upgrade. I’m not always a big fan of going out with the masses on Sunday, waiting in line for brunch, and feeling too full and coma like after to have enjoyed any of it. I prefer Sundays on my back porch (weather permitting), early morning even rather than midday, with the Sunday Times, and some homemade eats. I often make quiches. I’ve tried waffles. Eggs of all sorts. Chilaquiles. But this past weekend, I finally tried avocado toasts, which I’ve had out a bunch of times. And they were a hit. Mash 1-2 ripe avocados with a fork, salt, and pepper, a squeeze of lime juice. Set aside while you toast some hearty wheat bread (make sure its properly toasted, not soggy– it needs to hold up to the toppings). I quick pickled some thinly sliced red onion and fresh jalapeno in lime juice and kosher salt. I sliced some heirloom grape tomatoes. And I cooked some eggs sunny side up. While the eggs were cooking, I topped each toast with some avocado, a sprinkle of red chili flakes, the limed onions and jalapenos, the sliced tomatoes, and then the sunny side egg. All of this was garnished with some micro greens. Eat, down a Topo Chico, coffee, and relax. I imagine this is best served in summer and early fall, when the produce shines and every ingredient is appropriately ripe and in season. Bear in mind and avocado it up. eat | guac and chips. When I first visited Sean in Phoenix more than five years ago, he took me to this barrio cafe that served the best table side guacamole. Despite the fact that the avocados are the best avocados you’ll ever eat (unlike, often times, the ones that make it to us here in Boston), it had a really unique spin that I couldn’t get off my mind: pomegranate seeds. The idea of it at first seemed odd, but these little sour bursts are the perfect pairing for any good quality guac, and now I make it this way at home to remind us of that time–not only how delicious the food was, but how it started this thing for us that we keep going. Here’s how I make it: two ripe avocados, cubed. A bunch of cilantro, chopped. The juice of two limes, salt and pepper, the seeds of one pomegranate, one whole jalapeno chopped with pith and seeds (I like it spicy), and a dash of red onion. Serve with chips, an iced cold beer, and swoon.